Yay! Finally it is time to bust out the Halloween Tricks and Treats! 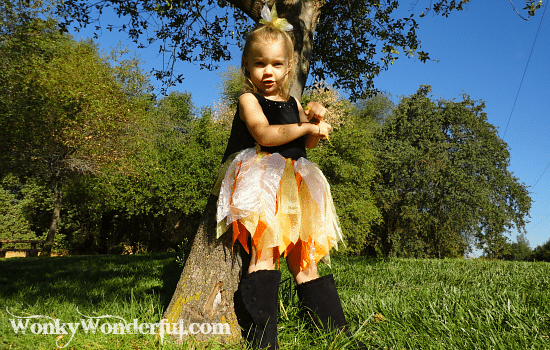 October is my favorite month … the weather begins to cool, candy everywhere you turn, my birthday, dressing up in costumes and Halloween of course!I’ve been wanting to make a super cute scrappy skirt for my daughter since seeing them on Pinterest. 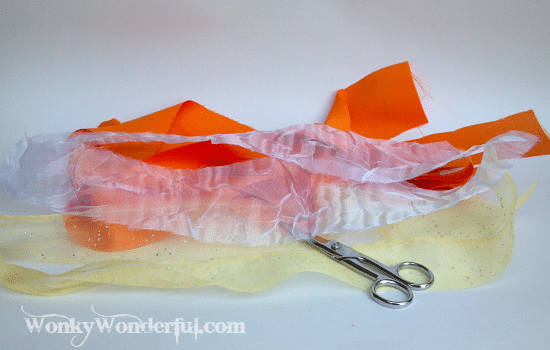 I have also been loving all of the candycorn colored Halloween projects. 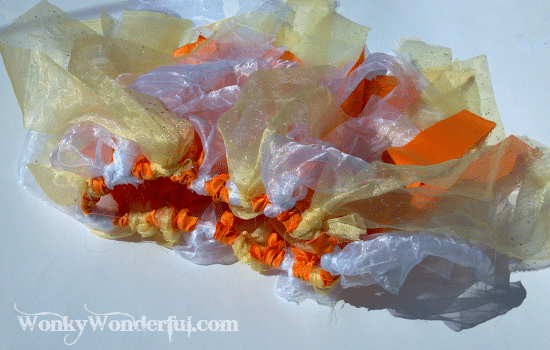 So, I decided to combine these two projects and make aCandyCorn Halloween Fairy Scrappy Skirt! Making this skirt isn’t Tricky at all. 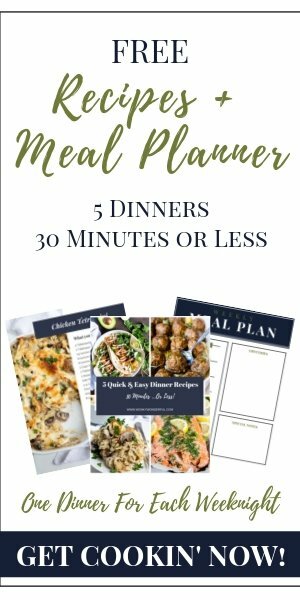 It is a quick, simple and inexpensive project. 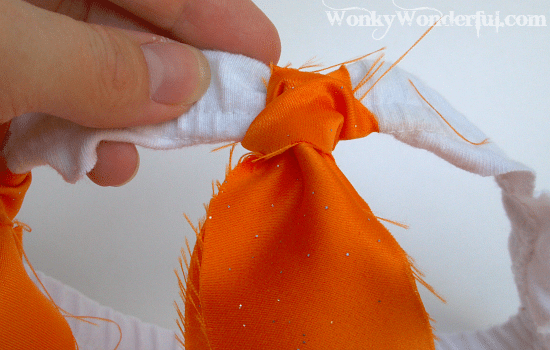 All you need is an elastic waistband, fabric and scissors. I have absolutely Zero sewing skills. So, I found stretchy pants that had questionable stains on the backside and just cut the elastic waistband off. 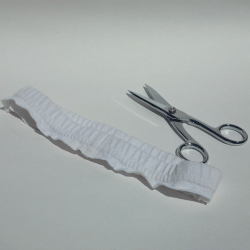 Be sure not to cut too close to the seam that way the fabric will remain on the elastic band. 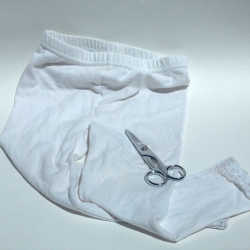 Also, make sure the waistband loosley fits your kiddo because the extra fabric will make for a tighter fit. 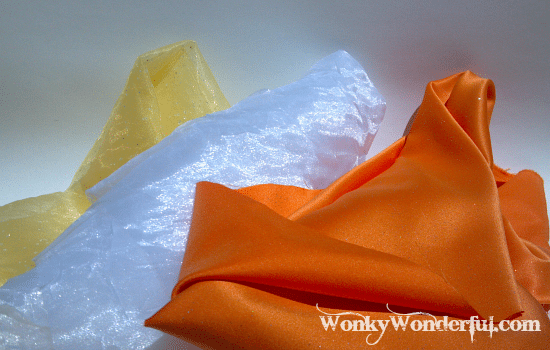 Keep the unused fabric for another project or to use as rags. double that length when cutting. 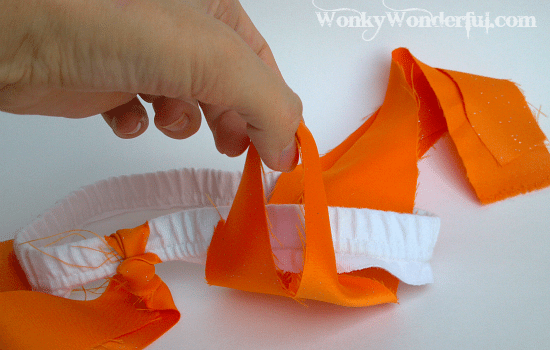 1) Fold the fabric strip in half and position the loop slightly above the waistband.2) Hold the top of the loop while placing the fabric ends underneath and up through the waistband. 3) Pull the fabric ends through the loop.4) Gently pull the fabric ends downward while wiggling the loop up until strip is secured to the waistband. 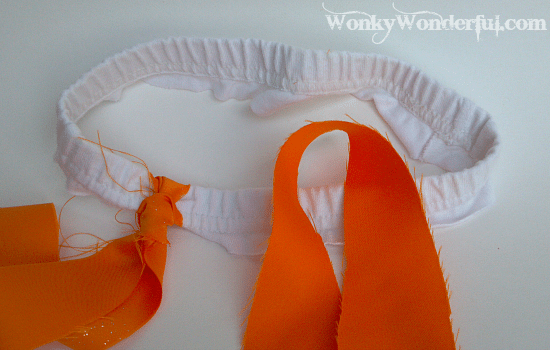 Continue to fasten your fabric strips until the skirt is full and poofy. I decided to cut the fabric ends at an angle so that it would look pointy, but that is optional. You can also add whatever extras you want: lace, ribbon, yarn or buttons. I tied some of the extra fabric onto an elastic hair band for a matching hair accessory.WhamOBlammo you are done! 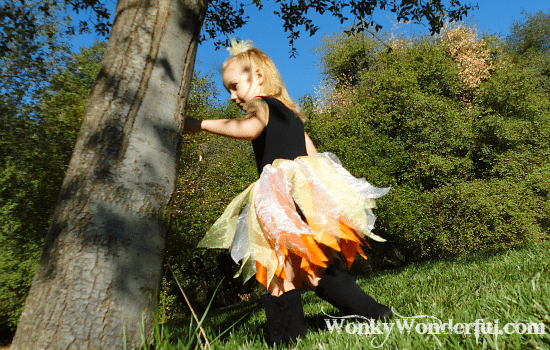 Now your Little Trickster is ready to frolic and play like CandyCorn Fairies do. 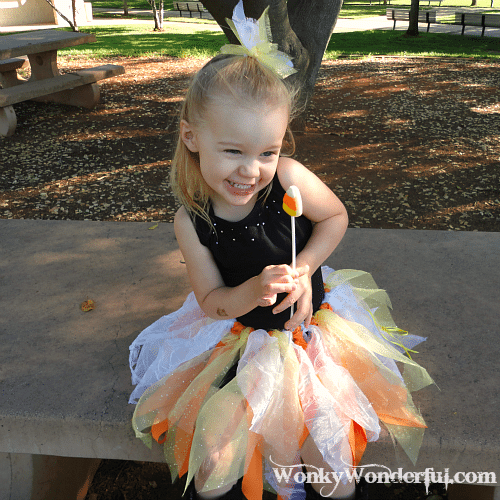 And every CandyCorn Fairy needs a wand … Or in this case a lollipop. I hope your Little Trickster loves her scrappy skirt as much as mine does. 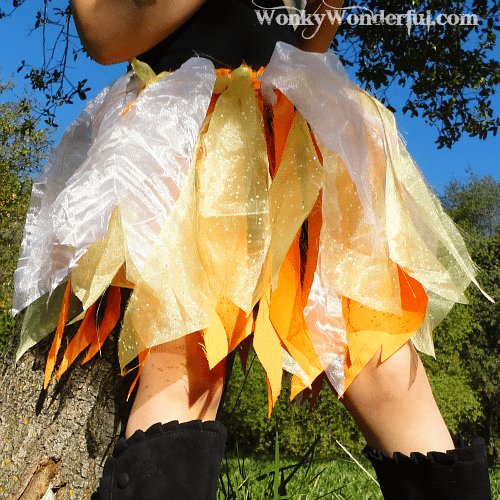 In all honesty, I want to make a CandyCorn Fairy Scrap Skirt in an adult size for Me!If you enjoyed this tutorial feel free to Pin or Share! « Coming Soon: My First Giveaway! Thanks Erika, glad you like it! Getting ready to make one for my little girl’s birthday. Any tips on how to keep the strips from fraying? Sorry for the delayed response Kara, I missed your comment. I kind of liked the frayed edges so that is what I was going for. I think there are products you can buy at the fabric store that prevent fraying though.